Marian Quartly in "The Brisbane Times": "Historians tend to argue that novelists don't write real history, but Keneally's work denies this. His detailed demonstration that the making of Australian democracy is part of world history places this work as an original contribution to Australian historiography. His knowledge of the roots of English and Scottish radicalism and Irish republicanism enables him to locate transported convicts and their crimes within networks of resistance whose significance is global." "Boomerang Books" weblog (reprinted from "Australian Bookseller & Publisher" magazine): "Is Tom Keneally a novelist who also writes history, or a historian who also writes novels? The question is academic, but his skills as a novelist certainly explain how he can convincingly mould a cast of literally thousands of characters together into compelling social history. 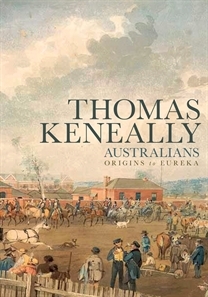 In the introduction to his latest offering, subtitled Origins to Eureka, Keneally pledges to tell 'the stories of a number of Australians from the Pleistocene Age to 1860'." Keneally in conversation with Brian Johns for SlowTV. This video was recorded at the Melbourne Writers Festival this year. James Urquhart in "The Independent": "Thomas Keneally's 26th novel shares the military fascination of his recent works while reaching as far back as his 1982 Booker Prize-winning Schindler's Ark for comparable historical weight...Keneally hints at a sequel to this impressive odyssey, taking Artem through the horrors of the civil war. That might allow more space for examining the anguished ethics of the revolutionary project, sidelined here by the bold sweep of history." Edward McGown in "The Telegraph": "Keneally's most famous work, Schindler's Ark, made fresh the horror of the Holocaust by centring on the contained, moral crisis of one man. Here, the author consciously abstains from the pleasures of a taut narrative focus. The People's Train is a disjointed work whose digressions are sometimes frustrating. However, the novel succeeds in casting an uneasy spell." Marcel Theroux in "The Financial Times": "The novel is pacy and packed with incident, but the welter of detail tends to overwhelm the characters. They're all rather sketchily drawn. Even the supposedly heroic Samsurov comes across as doctrinaire and one-dimensional -- a square-jawed homo sovieticus like the ones seen driving tractors on Soviet-era posters." Lesley Chamberlain in "The New Statesman": "The People's Train combines a fluency of narrative with woodenness of thought. It is that rare thing: a novel with too much action, and too little attention paid to language and style...Reading any text is a kind of detective assignment, and I found myself scouring these pages for the reason Keneally chose this particular subject matter. I arrived at the following hypo­theses. First, that he did so in order to remind an Australian readership what was happening in their country -- as far as the workers' movement was concerned -- in the run-up to 1917. The author sees the story as one of limited worker protests, attracting sporadic middle-class sympathy (principally from spirited women) as well as a great deal of police brutality, and a let-down on the part of the Australian Socialist Party." Keneally pitches in to protest against a reality television show being filmed at on a local historic site. Hi perry, just to let you know, the review published on Boomerang is actually from Bookseller+Publisher magazine. Cheers! This page contains a single entry by Perry Middlemiss published on October 30, 2009 2:54 PM. Reprint: Henry Lawson Warned Us of This by Denton Prout was the previous entry in this blog. Kingdom of Days is the next entry in this blog.